Happy Tuesday friends! 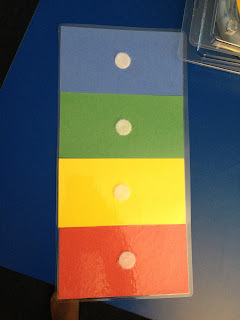 Today was Day 3 of Nurtured Heart Approach (see yesterday's post) in my class and it is already paying off! My kiddo who is almost always a huge behavior problem had a mostly awesome day! 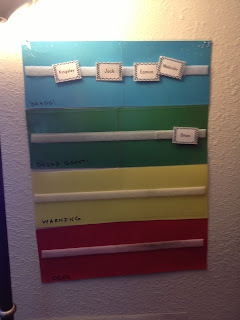 He had 9 of his 12 sections of his behavior chart as a good color (blue and green... yellow and red at the bad choices colors). This is a record for him! What makes it even better is how much the kids just love giving each other complements. If all the kids are off task all I have to say is "I need someone to give a complement to!" and everyone is in their chairs hard at work in 2 seconds flat! 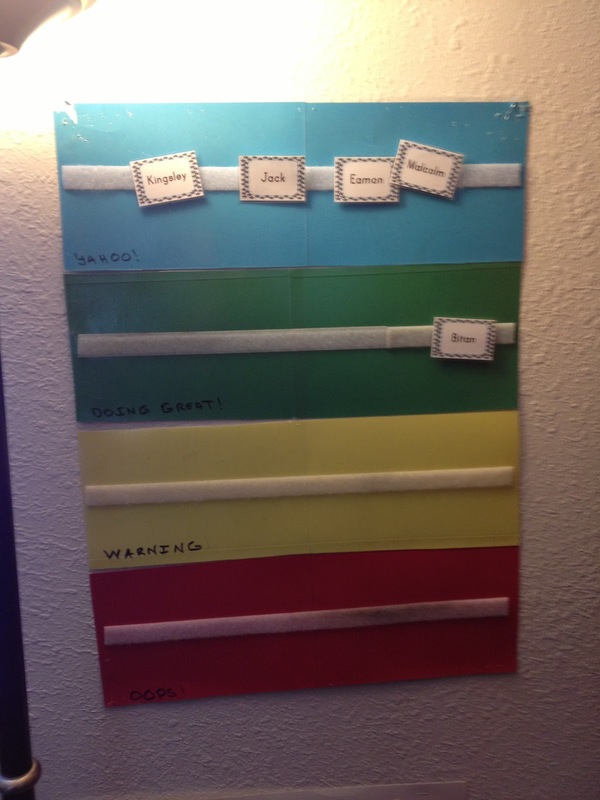 Below is a picture of my color chart and a mini one I just made for a student who wants it at home, and his parents think it will help too. Ok, back to test case kiddo. He's super, duper smart (I have my theory that he might be a genius...literally, no exaggeration) but he is by far the biggest challenge I've ever had behaviorally. I've had violent children that were easier to figure out and help than this little adorable boy. He is doing so well with "reset" and it really gets him back on track. All I say is "Reset" in a calm even tone and he runs outside, counts to 60 then comes in and gets right back to awesome work. I do this each time he breaks a solid rule, not if he's just bouncy/off task. For instance, if he's distracted or asks a kid to be quiet I'll just complement him for something he's doing right such as being polite and keeping his body to himself. If he invades personal space by touching someone/grabbing/yelling/being disrespectful, then I'll tell him to "reset." Today I saw a mixture of intentional limit testing, and actual mistakes/struggles, but overall he responded really well. On the playground I saw him grab someone and I yelled "RESET!" He instantly ran to the side, counted to 60, went back to the play area and apologized to the other student, and they played really nicely for the rest of recess. Someone asked me how I "make him count to 60" and this is a really good question. I have him count aloud so I can hear him, and I don't engage with him (talk to him) until I hear him do it. I try to avoid prompting him, but when I do I simply say "I'll talk to you when you are done resetting." I also don't talk to him about what he is resetting for because this focuses on the negative and I only want him to get attention for the positive. At one point he intentionally rocked back to far in his chair and fell backward on the ground. I saw he was fine and simply said "reset" and he kept asking me why. I didn't talk to him until he "reset" and returned. I turned the question back to him and asked him why I would say that. He said, "because I wasn't sitting in my chair the right way and made myself fall." Kids know when they did something wrong, they don't really need you to say it. Since I've been giving so many complements to all the kids all day, they've started doing it to each other too. Every time a student moves up on the behavior chart they cheer! Also, my kid who struggles will talk about his behaviors because he hears me complement him. Today he said, "I thought about grabbing him, but then I stopped myself!" and I gave him a big hug! Yay for self-regulation! 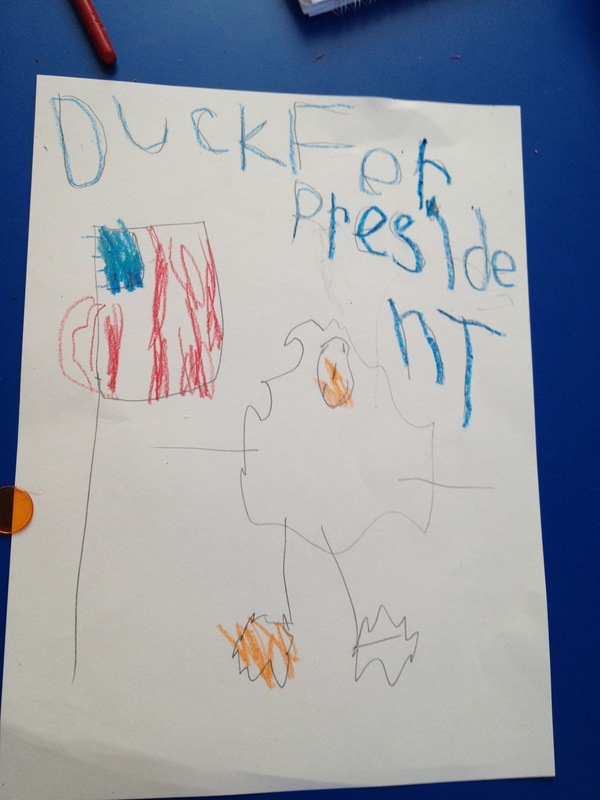 Okay, back to general ed stuff... Election Day! I may teach special ed, but I keep my expectations high. 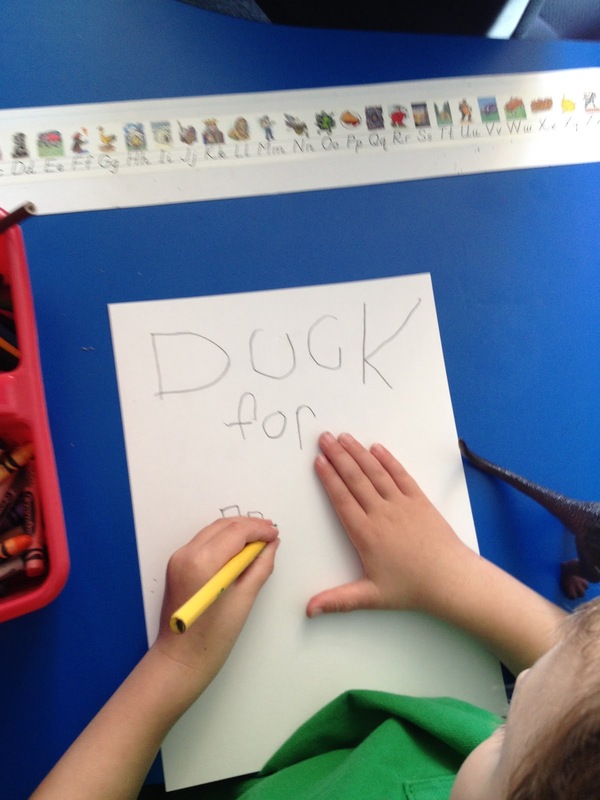 My kids always work at grade level with appropriate support. 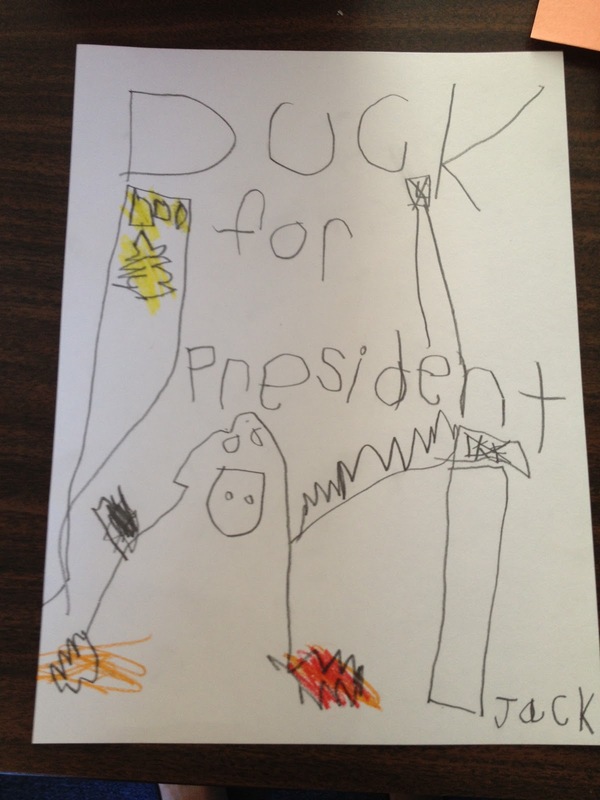 Today I read Duck for President and then I had the students respond to the story differently depending on their grade level. 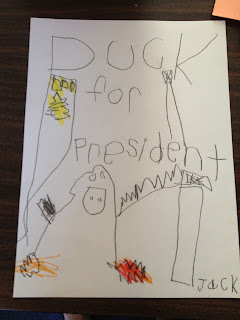 My kinder kids created adorable campaign posters while my 1st/2nd kiddos completed a True/False worksheet I got from Scholastic based on events in the story. Hats off to you!! What was your student's initial response to "reset"? I can imagine someone just refusing to count. Did you discuss it before hand? Honestly, I had the unfair advantage that the student's mom introduced me to this system, so he had a couple days of it at home first. She tested it there while I was using her books and CD's to fully understand the program. 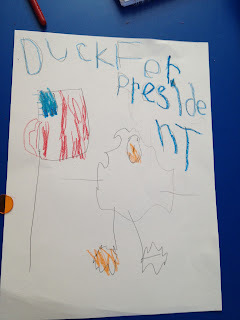 Then when I started it at school, I talked to him about it before the school day began. To avoid having him refuse to count, I make the class as obnoxiously positive as possible so that he wants to hurry up and come back to class so he can get more compliments. I give him instant praise when he comes back from a "reset" and gets to work so he associates it with something good instead of something bad. It keeps him going forward instead of turning to self-destruct mode.